Hatchet Cove Farm is now the proud home of not one, but two family cows! We brought Sugar the Jersey cow and the yet-to-be-named baby Dexter home on Saturday afternoon. They seem to be adjusting well and we hope they will become good friends. In anticipation of the milk that we will soon be swamped with, I got excited and purchased an ice cream maker. It is unlikely, though, that even my insatiable appetite for all things dairy will be able to keep up. 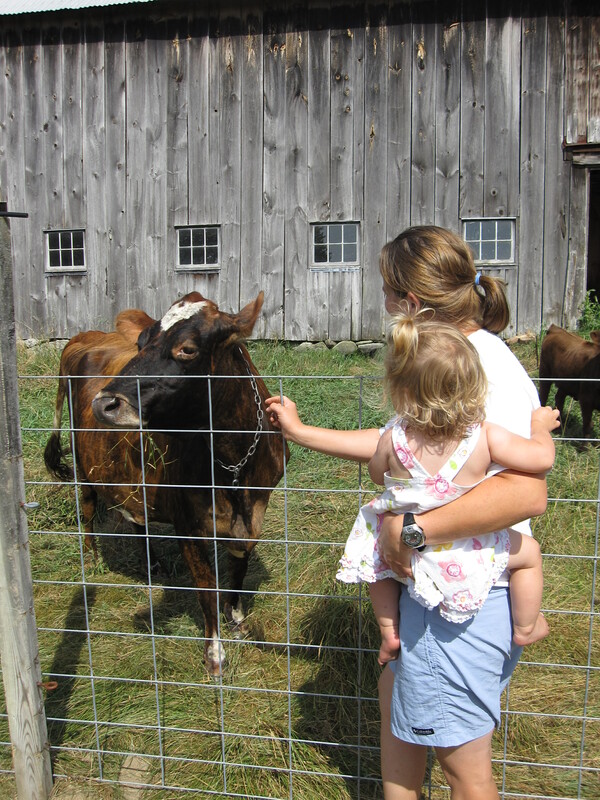 Do you have a raw milk-loving family? We’ve been having quite a bean bonanza (as you can tell from the big bags the last few weeks). Bill and the apprentices have been troopers in the neverending bean picking task. If you are interested in buying beans in bulk for freezing or canning, just let me know. You can buy 5 pound bags (as many as you like) for 10 dollars (our wholesale price). For size reference, this week’s bags are 1.5 pounds. We will also eventually have a pick-your-own time, if you would prefer to come to the farm and gather up as much as you like on your own steam! This week we had our first return-wwoofer: the famous Minna LaTortue. It has been so great to have her here. And next week, Carolyn Niehouse (last year’s beloved fall apprentice) will be coming back. We’re so lucky! We hope that between family and friends you, too, are having a great August. And while we want our friends and family to have continued beautiful weather during their visits, the crops could really use some rain. So may we all wish for what seems like the best of all worlds: a few good rainy nights and sunny days. Hope you’re keeping up with all the veggies, and enjoying some great meals.